Back in summer, I hinted that there would be changes around here come fall. Why fall? Because as of this issue, we're seven years old. Seven years of Knitty, as we've grown and changed and brought you the wonderful and the weird...all with a slightly warped sense of humor. It's fall. And the changes promised in summer are here. We're so excited, we can barely sit still [or perhaps that's because we've been tied to our chairs for weeks, making all this happen]. So what is it? Well, you're holding it in your hands. Or looking at it on your desktop. Or reading it on the bus, in a taxi, on a plane or train. It's the new Knitty. See, Knitty was designed by a words-and-pictures girl back in 2002 [that'd be me]. My knowledge of HTML is pretty much survival level, though it's grown over the years. Anything more complicated than reasonably basic code makes my head hurt. Thankfully, I happen to be married to a man with a brain the size of a planet [say hi, Philly!] who thinks in code. And as Knitty's seventh anniversary grew closer, he and Jillian and I decided it was time for more than just a new coat of paint. So what's new? The biggest change is that Knitty now takes up more on the screen that you're looking at. This gives us some elbow room to design in, and most importantly, it allows us to enlarge the size of our ad spaces. We think our advertisers deserve it! After all, it's the support of our advertisers that allows Knitty to come to you at no charge. Please support our advertisers in return! Meanwhile, page content [like articles and patterns] is as large as it's always been, and everything continues to be printer friendly. Yay! The next big change is the navigation. We used to have buttons at the top and down the left side of every page. As the years went by, this system was getting more cumbersome and restrictive, so it's gone! We now have a lean and clean CSS menu at the top of every page, with categories for everything you might want to find in an issue of Knitty. Even things you might have had to hunt for in the past you'll now find with a simple click. The navigation typeface has been simplified and enlarged [I hear the cheering already!]. Best of all, the menu works brilliantly on iPhones and netbooks. This makes my geek soul very happy. You'll get very familiar with the first button on the left of the new menu: that's where you'll find every section of the current issue of Knitty. And there's now a search box in the header on every page, so you don't have to go clicking elsewhere to find something. Just type and go! 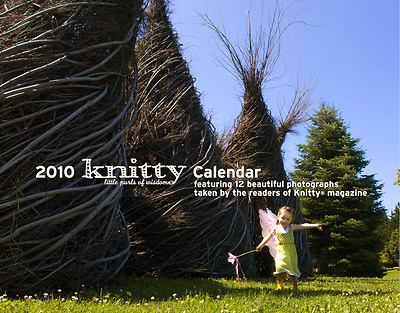 You've always been able to access back issues of Knitty through the Archive button. We decided that it needed a new name to better reflect what's in there, so it's now called the Library. You can still find every category of knitting project or article as well as the covers of every issue so you can browse leisurely if you wish. And yes, we're planning a big Library redesign in the near future. Stay tuned! This redesign involves a huge amount of brand-new back-end code that you'll never see. It's possible something might need a little tweaking, so if you find something broken, we'd love it if you'd send us a little note about what you've found. We'll work to get it sorted out as quickly as we can. Just write me with the details, and please include the operating system your computer uses [Mac or PC] and the browser and version [i.e. Firefox v3.5.2] you read Knitty with. This tech stuff helps us immensely. So there you go. A big, shiny new Knitty for you to share and enjoy. Please feel free to click all the buttons and poke about in our drawers. We'd like that. Want to know when the new issue goes live, or if there's a new surprise? Sign up for the free Knitty reader list! The list is never shared with anyone, ever, and we only send out a few messages a year. We know our internet manners. To find out what's up with Knitty on an average day, or even on a big news day, click here to add the Knitty blog to your RSS reader. 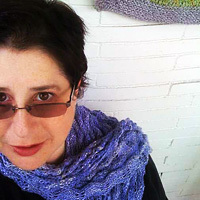 If you use Twitter, you'll find Knitty's Twitter page here. Win the yarn for one of the projects in this issue of Knitty or a great bag to put it in! For fall 2009, we have two great giveaways! Artyarns has generously offered to give one lucky knitter the yarn to complete the beautiful Tanis hats. Shimmer and a little bling! Offhand Designs makes gorgeous bags by hand from vintage-style fabrics, built to last. This issue, you could win the awesome Suzannah bag shown on our Cool Stuff page. To be eligible to win either prize, simply join the Knitty reader mailing list using the form below! If you're already on the mailing list, you're automatically entered! Knitty list members can be assured their e-mail addresses are never shared, given or sold to anyone, period. One lucky list member, chosen by a random number generator, will win each prize! The first name drawn will win the Artyarns kit (approximate value of prize: $60); the second name drawn will win the Offhand Designs bag (approximate value of prize: $160). Winners must answer a skill-testing question in order to receive prize. Winners' names are listed above. The entries were fabulous this year, and choosing the winners was harder than ever! I hope you'll join me in congratulating our winners! You can find the full calendar here! watch the Knitty Twitter feed for news! Fall is the great nesting time for spinners. We visit the last big fiber shows like Rhinebeck and Taos, buying, buying and storing away our fiber like a squirrel stores her nuts. A lot of guilds, mine included, have big fall sales. For the first time, I’m participating in selling, revisiting some of those fibers from past shows repurposing them into new batts. Making batts sent me to my fiber stash with unexpected results. 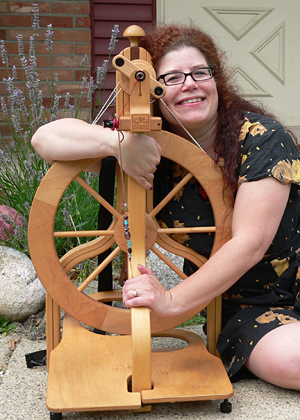 I had squirreled away a lot of lovely fibers, but it was the stories and memories I had stored away that made me smile the most – standing in line for the Rhinebeck rush, a batt bought from a fiber artist no longer selling, several "me too, I’m a lemming" bumps. Lots of memories, lots of warmth that I’ve squirreled away for the winter to come.. So when you’re collecting new stash at shows, sales and shops, know it’s not just the fiber you're gathering.